There’s a certain type of fighter that Las Vegas is looking for, likes and will keep in its stable of stars for a long time. Boxing skills will definitely get you a chance to display your wares in the entertainment capital. But there has to be something more, a quality that appeals to the audience that will shell out dollars for a boxing card rather than on the slot machines, the tables or the other entertainment options on the Strip. That’s raw courage, a ferociousness that arouses the warrior nerve in all of us. From the first time Manny Pacquiao set foot on a Las Vegas stage, he has hardly left it, winning most of his fights, save for the draw with Juan Manuel Marquez and the decision he lost in the first Erik Morales duel. Filipinos aren’t the only ones who find the Pacman engaging . Folks from all walks of life and ethnic backgrounds pay to see Pacquiao fight. Pacquiao brought to Vegas a fire that many had not seen in the square ring of late, a hunger that floored opponents or forced them to drop their defenses. The skill was there, perhaps needing polishing in the years ahead, but there was a rawness that caught the fancy of the Vegas crowd. Pacquiao was a performer on his stage. He has perhaps become more calculating of late, but Pacman continues to be a Vegas top draw because non-stop action is guaranteed when he fights. Michael Karsidis looked like the kind of brawler that appeals to the Vegas audience. A relentless attacker despite being bloodied in al most every fight, he is interesting to the fan that arguably sees a bit of himself in Katsidis. His last toe-to-toe encounter with Filipino Czar Amonsot in July last year at Mandalay Bay in Vegas is a case in point. He carved out a unanimous decision for the WBO Interim lightweight crown by simply being relentless, stopping at nothing until the final bell rang. In yesterday’s Ring Magazine Lightweight World Championship against grizzled warrior Joel Casamayor, Katsidis was well on his way to a major victory in his young career. 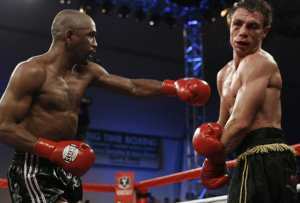 After surviving two quick knockdowns in the opening round, Katsidis immediately shifted to pursuit mode and stunned Casamayor relentlessly for eight rounds. As Katsidis himself admitted in the post fight interview, he became a tad careless at the top of the tenth round. Casamayor found a wee bit of daylight in a fight that was slipping from him and nailed the Australian with a huge bomb that sent Katsidis spinning straight to the canvas. Casamayor chased Katsidis after the eight count with the Australian still reeling from the shock of the knockdown and could not offer any resistance. Referee Jon Schorle stepped in and Katsidis was left with his first loss in 23 fights. Though yesterday’s loss was at the Morongo Casino Resort and Spa in Cabazon, California, Karsidis should be in a fight card in Vegas soon. Las Vegas likes a performer, win or lose. Katsidis wearing a Greek helmet for the walk-in doesn’t hurt one bit. Top photo: Ring Magazine World Lightweight Champion and newly crowned WBO Interim World Lightweight Champion Joel Casamayor (left) lands a left on former WBO Interim World Lightweight Champion Michael Katsidis (right) on March 22, 2008 at Morongo Casino Resort & Spa in Cabazon, California which was televised live on HBO's Boxing After Dark. Hogan Photos / golden Boy.